The city that changed architecture forever Archi-new - Free Dwg file Blocks Cad autocad architecture. Archi-new 3D Dwg - Free Dwg file Blocks Cad autocad architecture. Chicago. The Windy City. 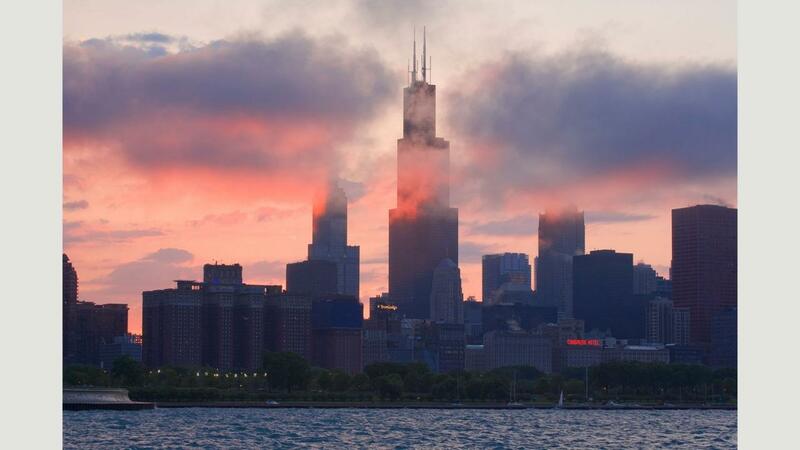 Even Chicagoans are not exactly sure why their impressive hometown bears this name. It might be because of the winds sweeping across the vast plains and Great Lakes flanking the city, or – and this should be taken in good humour – because Chicago has long been a swaggering place, boastful of its scale and achievements. When the settlement was founded in 1830 on the south west of Lake Michigan, its population was less than two hundred. Designated a city seven years later, this had grown to 4,000. From then on it skyrocketed with wagon trains, boats and then trains bringing hundred of thousands of emigrants to the Midwest and the boundless opportunities it offered. From 1848, the Illinois and Michigan Canal provided a trade route from the Great Lakes to the Mississippi all the way south to New Orleans, while railroads soon connected Chicago to all points of the American compass. 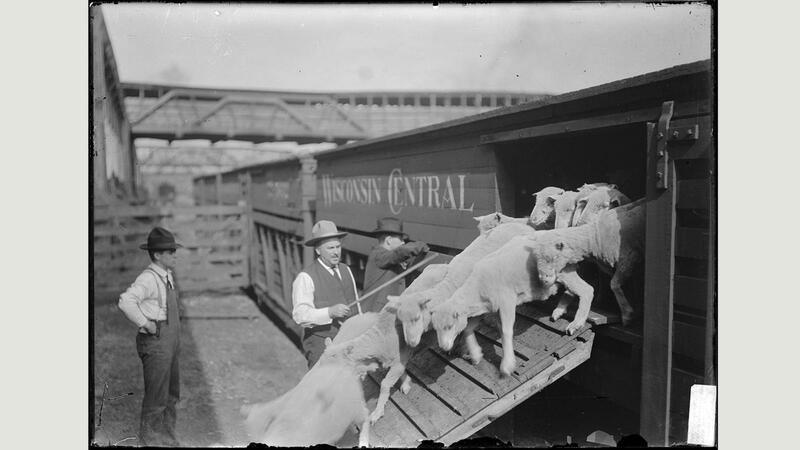 Now, imports and exports flowed through Chicago from all over the world, while from 1865 millions of cattle were transported to the Union Stockyards, the city’s enormous meatpacking district created by the railways. By 1900, the stockyards employed 25,000 people and produced more than 80% of American-reared meat for the nation’s domestic market. Manufacturing, banking, commerce and culture along with salubrious public parks and the country’s first comprehensive sewage system were all part of the city’s phenomenal growth. 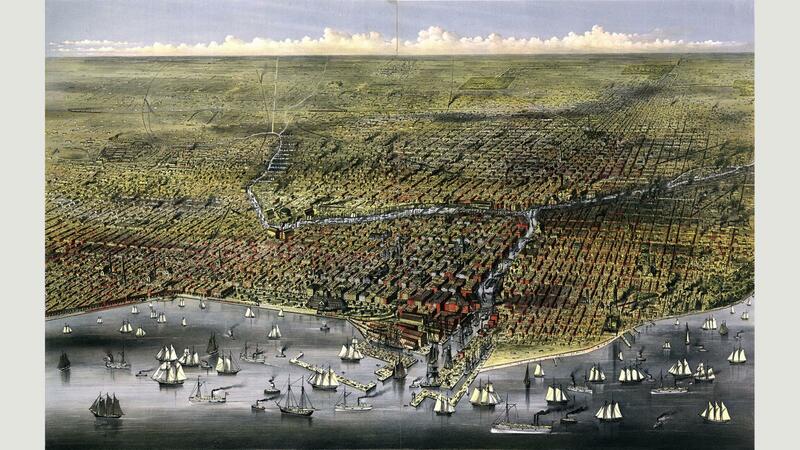 In 1880, Chicago’s population was 505,000. Ten years on and it had more than doubled. 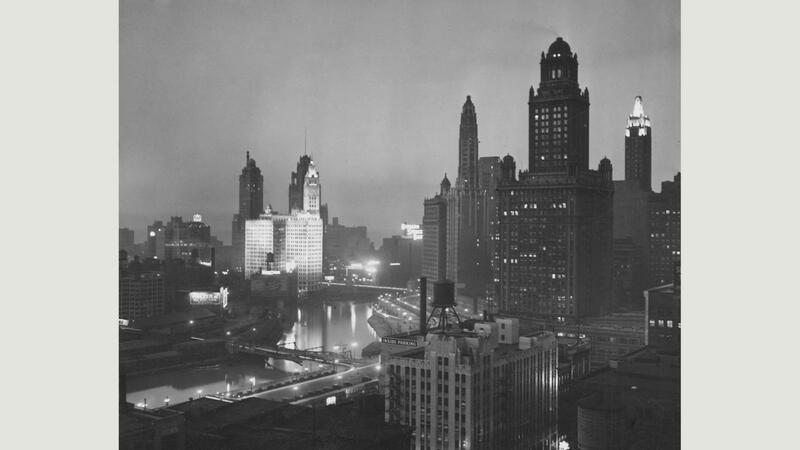 Each decade from then on until the Wall Street Crash of 1929 Chicago’s population grew by half a million. While there was plenty of space on the windswept plains to house so many people, the city’s commerce was concentrated in a tightly focused district that, as space became a premium, shot skywards in scores of big, bold and dazzling buildings. By the mid-1880s, these included the world’s first skyscraper. There was, however, more to the meteoric rise of Chicago’s dramatic architectural skyline than this. On 8 October 1871, a fire swept through the young city along a four-mile corridor. Three hundred people died, 100,000 were made homeless and 17,500 buildings were destroyed. A third of the city’s wealth was reduced to cinders. But Chicago rip-roared back to life. The city centre was laid out on a new grid. New forms of fireproof construction went rivet-on-rivet with the latest building materials and components, while two recent inventions revolutionised Chicago’s post-fire architecture. These were the safety elevators pioneered by Elisha Otis and first demonstrated to a thrilled audience at the New York World’s Fair in 1854 and the Bessemer Convertor of 1856, an English device allowing the mass-production of high quality, low-cost steel. Charged with bringing their city back to life and pre-eminence, and to outdo New York, Chicago’s architects were now able to build sky high. Until the mid-19th Century, five storeys had been the normal maximum height of commercial and residential buildings. People could not be expected to walk up, much less to fetch and carry goods, to higher floors. Was such a tall building safe? 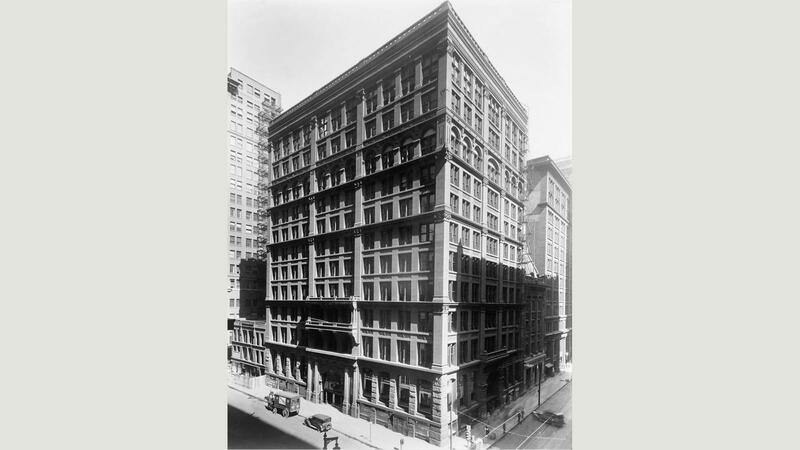 The world’s first skyscraper was the 10-storey Home Insurance Company on the north west corner of LaSalle and Adams Street, designed by William Le Baron Jenney and completed in 1884. Although its frame, or skeleton, was made partly of wrought and cast iron, it also featured Bessemer rolled steel beams. Dressed in grand Renaissance terracotta and stonework, this 138-ft-high building weighed only a third of an equivalent solid brick or stone buildings. At first this caused city officials some concern. Was such a tall and light building safe? At the time the majority of US architects and the expert press scoffed at the idea of a future generation of steel-framed buildings rising to more than 25 storeys. In reality, the only danger faced by the designers and contractors of the handsome and epochal Home Insurance Building was the very economic success it engendered. It was demolished in 1931, its place taken by the 54-storey Art Deco Field Building. As it spurted, Chicago had a tendency to gobble even such historically important designs as the Home Insurance Building. 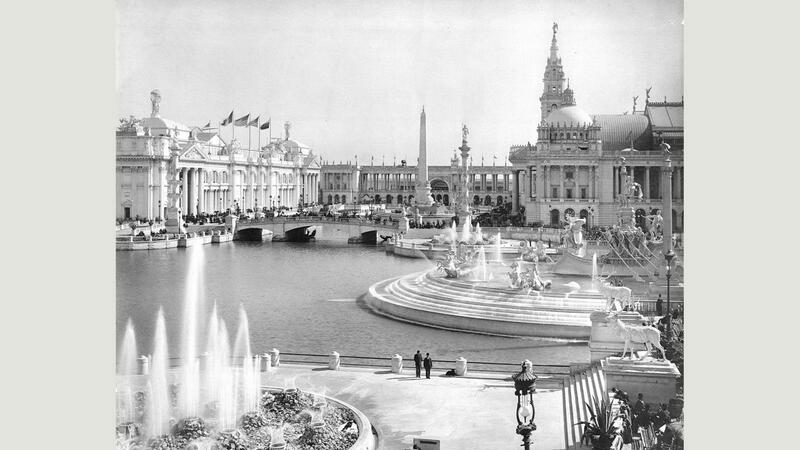 By the time of the triumphal Chicago World’s Fair of 1893, visited by 27.5 million people from around the world, the city’s confidence had reached an all time high. Quite how it should look in the new century, however, was a question debated by architects and the public alike. In 1909, Daniel Burnham, the showman responsible for the much of the planning and many of the 200 grand temporary buildings of the 1893 fair, produced a comprehensive city plan for central Chicago. Its style was Beaux-Arts classical, heavily influenced by the latest, and rather conservative, thinking from Paris. The plan itself was good, although Chicagoan architects had other ideas about new buildings. As they struggled to address the aesthetics of skyscrapers, Louis Sullivan, a former assistant to William Le Baron Jenney, developed designs for skyscrapers emphasising their verticality. The ‘Chicago School’ gathered around him preached his gospel: “form forever follows function.” This would be the creed of the Modern Movement. 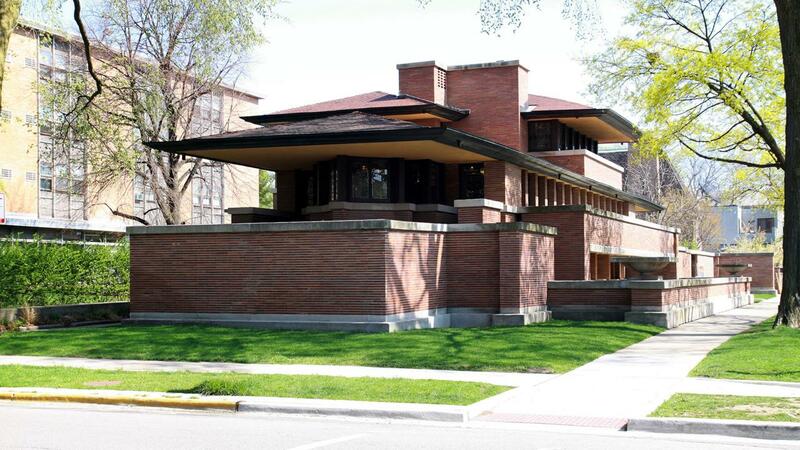 Sullivan also mentored Frank Lloyd Wright, to date the most celebrated and influential US architect. Wright developed his low-rise, open-plan ‘Prairie’ homes in the suburbs of Chicago from the 1890s, notably at Oak Park, although half a century later he proposed a mile-high skyscraper, The Illinois, for the city centre complete with atomic-powered elevators. While The Illinois never got off the drawing board, its gung-ho design was a distillation of the city’s restlessly aspirational spirit. In the first decade of the 21st Century, Adrian Smith, then working with SOM Chicago, designed the world’s tallest building, the Burj Khalifa in Dubai. SOM had also been responsible for Chicago’s tallest building, 108-storey Willis Tower (formerly Sears Tower) opened in 1974. The world’s tallest for a quarter of a century, its structural engineer was Fazlar Khan, a Bangladeshi-American, who revolutionised skyscraper design from the late 1960s by making them much lighter than ever before with tube frames and external skeletons. Without the need for internal frames, a new generation of tall buildings offered ever more profitable rental space the higher they reached for the sky. Diversity as well as height, profitability and sheer braggadocio have also been hallmarks of Chicago’s 20th and 21st Century architecture as the city has been infused with jazz, blues, soul and other new sounds and cultures. 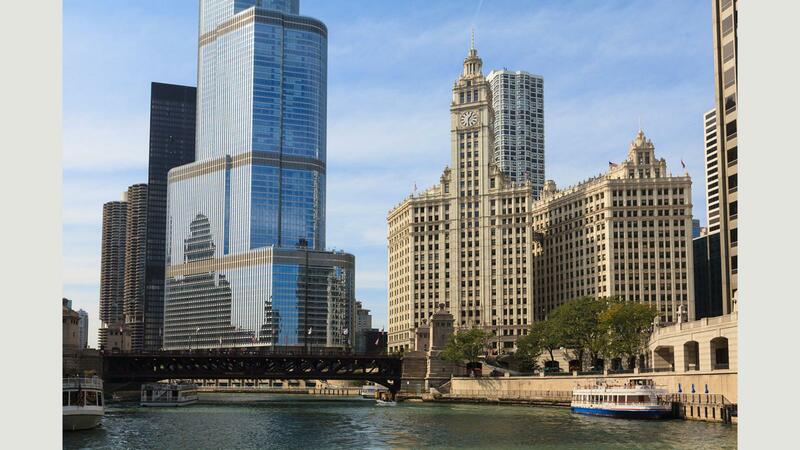 From the 1920s Wrigley Building with its French Renaissance facades and Spanish cathedral tower to Ludwig Mies van der Rohe’s sleek, minimalist 1960s Federal Center and Studio Gang’s animated 82-storey Aqua Tower, Chicago abounds in inspired modern design. Best of all, perhaps, and despite it sprawling suburbs, many of these heroic buildings are shoehorned into a compact and walkable downtown area.